In my last post I commented on the strengths and weaknesses of the Monologue Basics sketchbook, and mentioned that I liked using it for practice drawings. 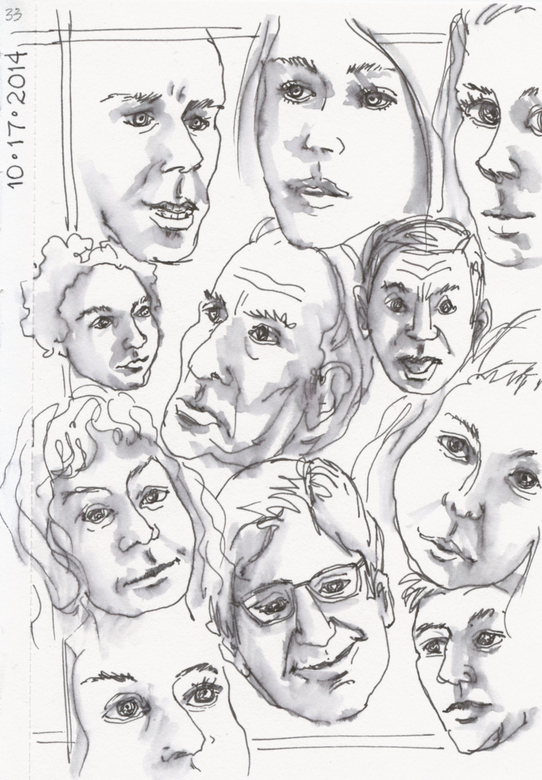 One of the things I always feel I could use more practice in is drawing people, and I've hit upon an easy way to find people to draw - I use the DVR on our TV. It's easy to pause the action and do a quick five-minute sketch of a character, then move to the next scene and do another. 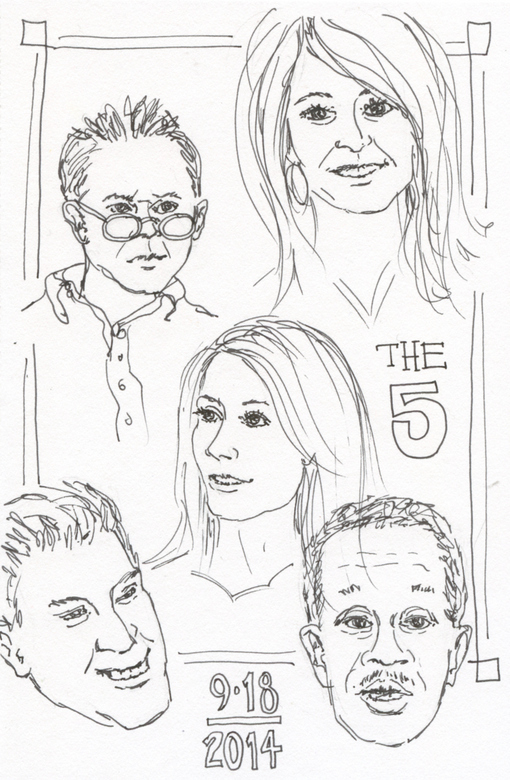 It's a fun challenge to try to draw all the actors in a movie or TV series. 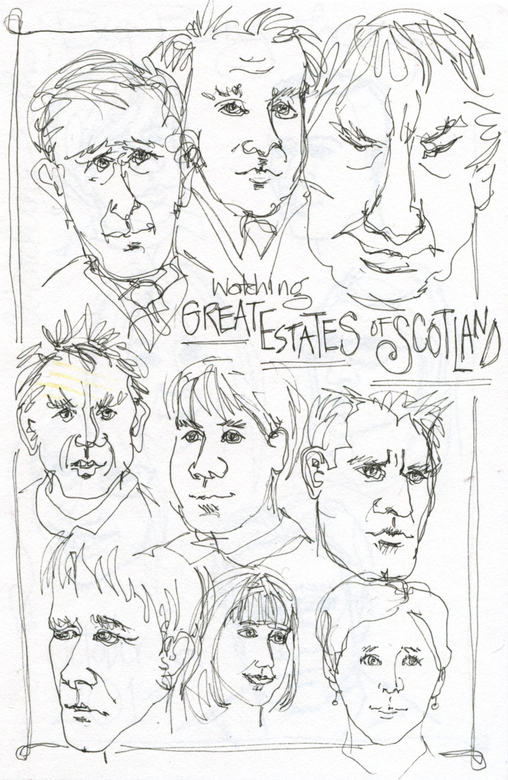 These are all drawn in the Monologue Basics A5 sketchbook directly in ink, with no preliminary pencil sketch. It's really good practice, because I find myself being much more careful than when I have the option to erase. I have to really look at what I'm drawing and analyze angles and relationships before I put pen to paper. Sometimes it works better than others, but I don't stress over the irregularities and out of whack proportions. This is practice, and it's fun, and I'm learning and improving. That's what's important. I want to get to the point where I can do a quick sketch on location without fussing too much. Sketch #2 is much more relaxed. 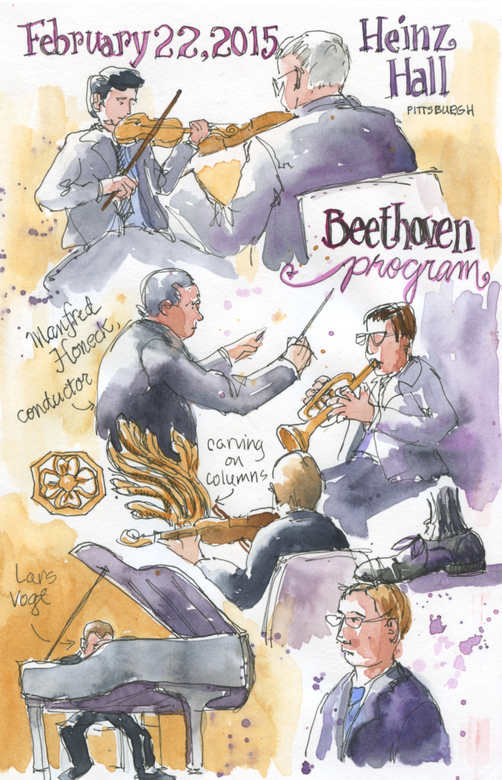 Maybe Beethoven was making me more mellow. By Sketch #3, I felt like I was getting the hang of it. I finished off the sketches with some watercolor the next day at home. 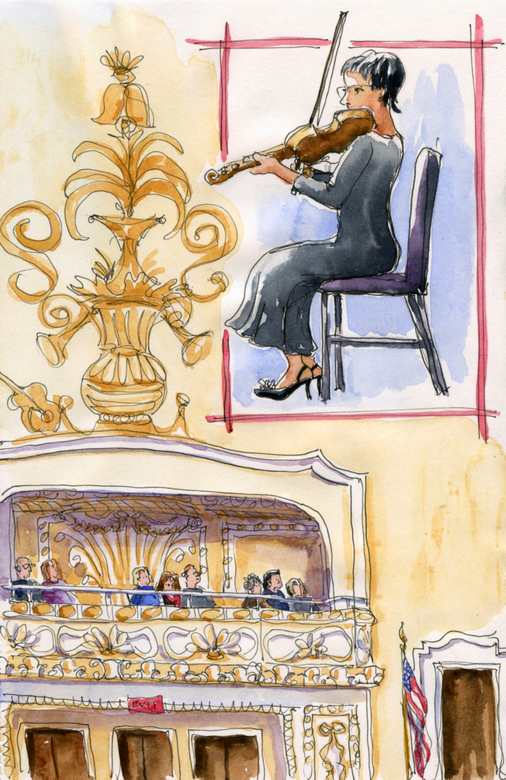 I'm glad I got up the nerve to pull out my sketchbook at the concert. What a cool experience, to sit there doing what I love to do, listening to that wonderful music with one of my favorite people in the world, my mother. Practice is great, but eventually you have to be brave and get out there in the real world. 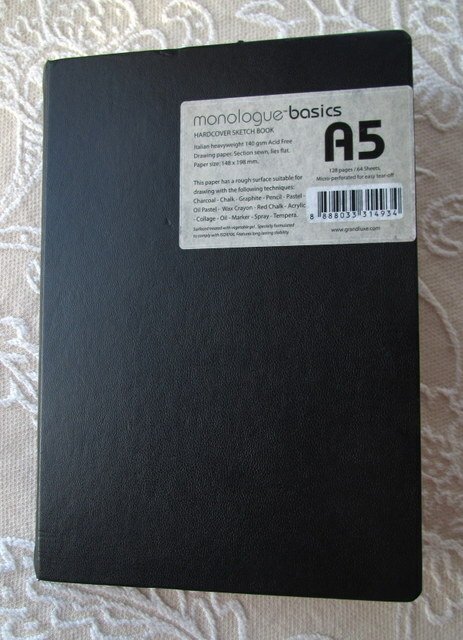 A few months ago, the Monologue company sent me a few of their sketchbooks to try, and I decided to play around with the A5 hardcover to see how it handles the materials I normally use for sketching: ink, colored pencil, watercolor pencil, and watercolor paints. 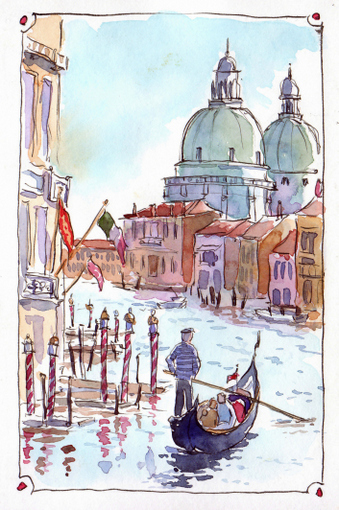 It measures around 5-1/2" x 8", and the paper is listed as 140 gsm "Italian heavyweight". 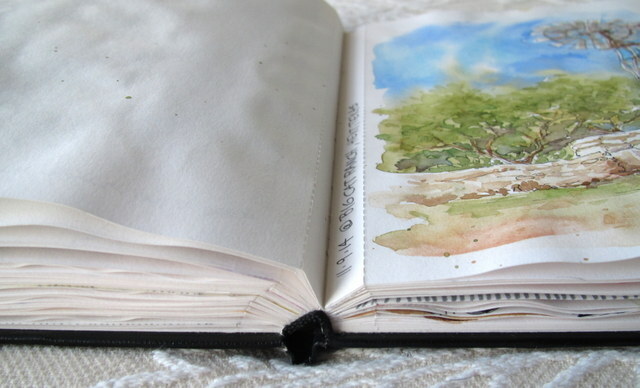 I've used this sketchbook as a casual practice book, one where I can fool around without worrying about the end result, but I would not use it as my primary sketchbook. The paper is too thin for watercolor - it wrinkles badly, and colors look much duller on it than what I'm used to with my Stillman and Birn sketchbooks. Some ink pens perform just fine, while others bleed on it. Lines show through on the paper, so I do not draw on both sides. The spine opens flat, which is nice, but all of the pages are perforated about 5/16" in from the spine, and the perforations tear apart easily with normal wear and tear. 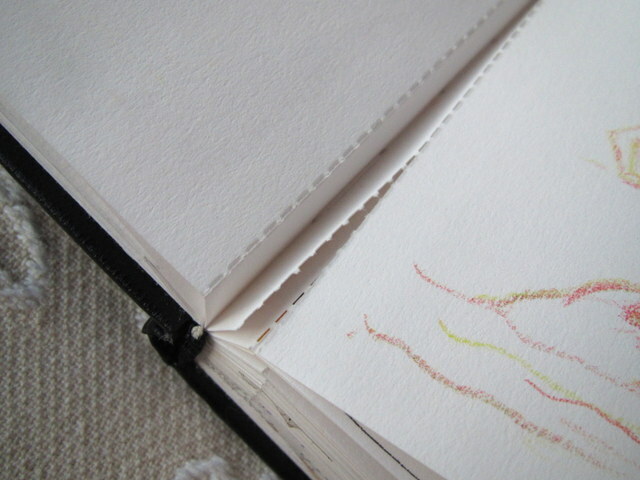 I've had to put tape at the lower edge on the back side of most of the pages to keep them from tearing out. This is the one reason I would never buy this sketchbook. I don't like perforated pages. The perforations are unnecessary and they lessen the usable space on the page, making an already narrow vertical format even narrower. 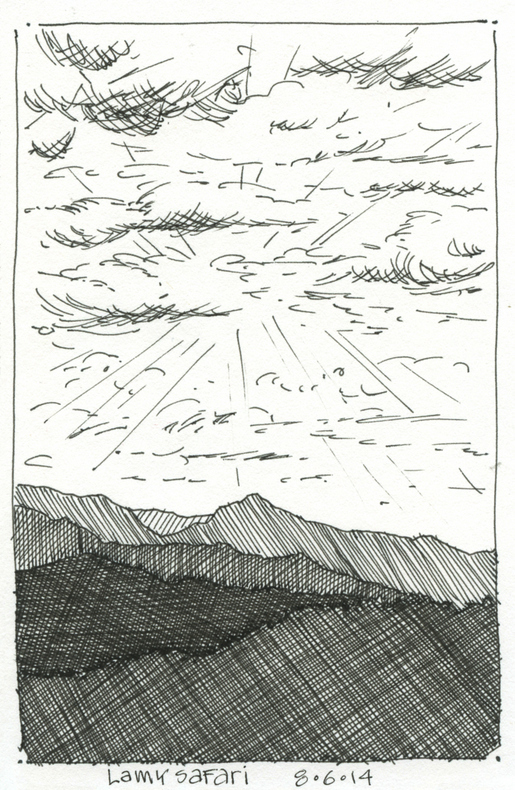 On page one I tried out a Lamy Safari fountain pen with Noodler's black ink. 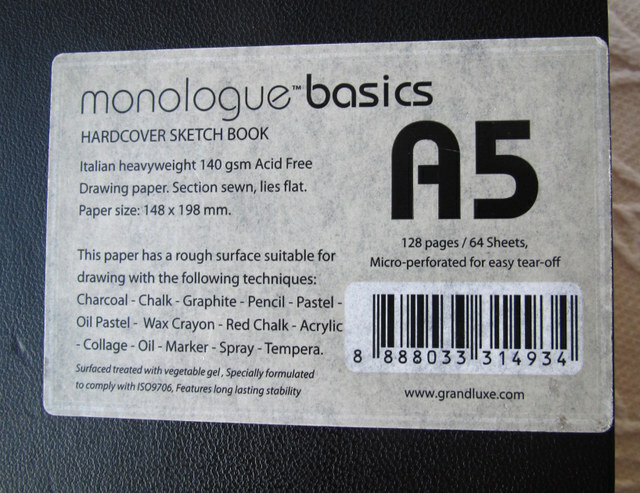 It worked well, with no feathering or bleeding on the Monologue paper. The Pitt Artist's Pen worked great for this next sketch - nice, clean lines with no bleeding or feathering. 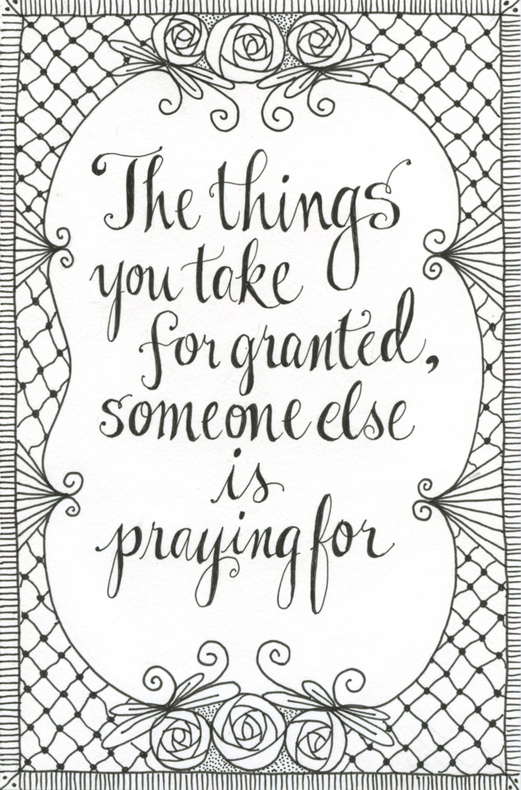 I saw this quote online somewhere, and it really touched me. Taking the time to add it to my sketchbook ensures that I won't forget it. 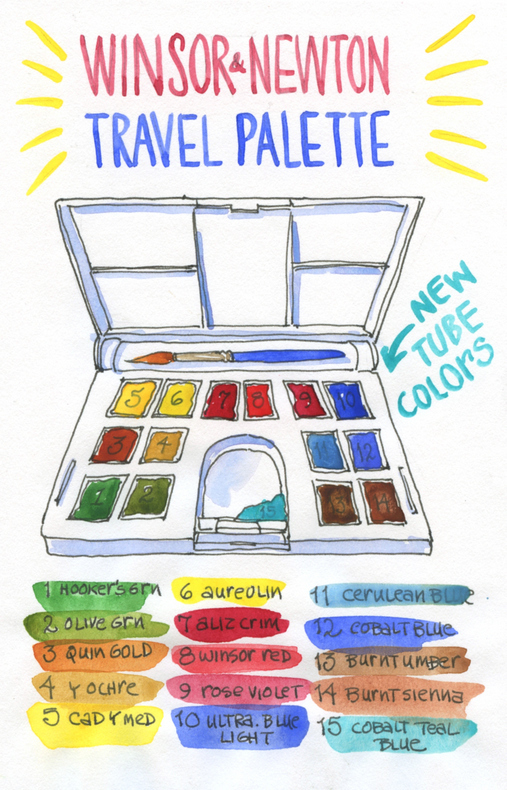 I've had this tiny Winsor & Newton travel watercolor set since I was in my twenties, but I never liked the paint it came with, so I finally cleaned it out one day and put fresh paint in it. I've used it quite a bit since then and like it much better now. 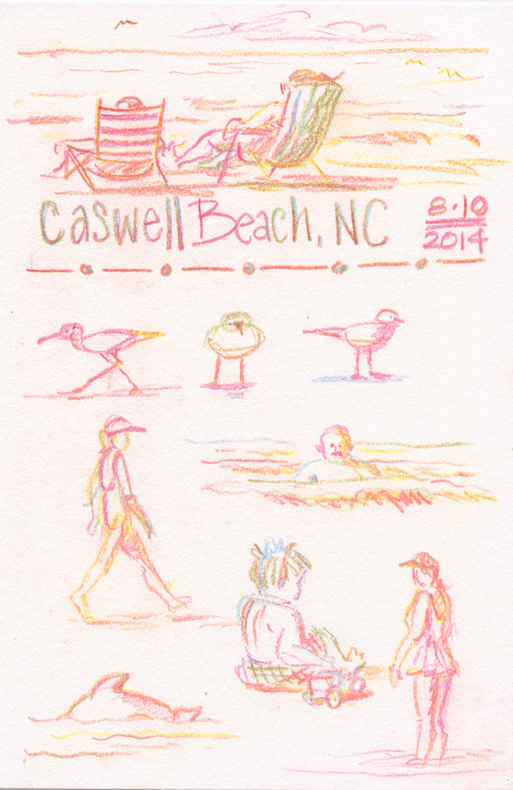 This next page is the only sketch I managed to finish during our family beach vacation last August. 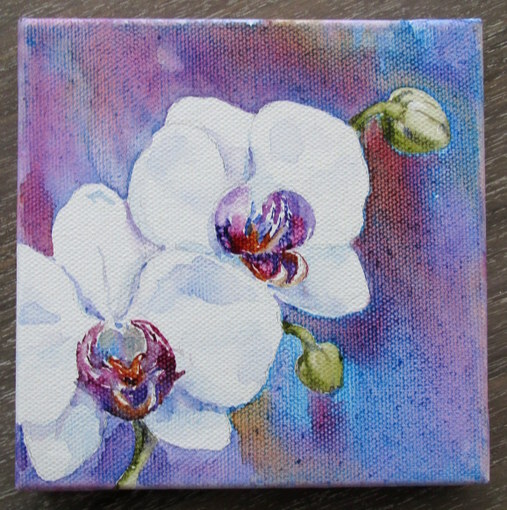 I was too busy playing with my adorable grandkids to pick up my paints. Here I tried out a green Bic Mark-It Ultra Fine Point permanent pen. It tends to soak into the Monologue paper and bleed through to the back side. It also bled whenever I paused in drawing a line. 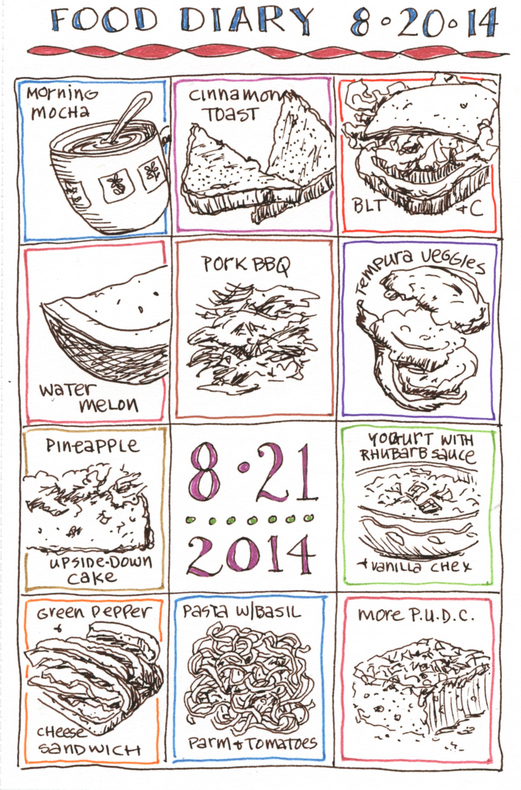 Keeping a drawn food diary is a good way to be more mindful of what I eat. This day's diary was drawn with a Noodler's flex pen filled with Noodler's walnut ink, which gives a nice dark brown line. 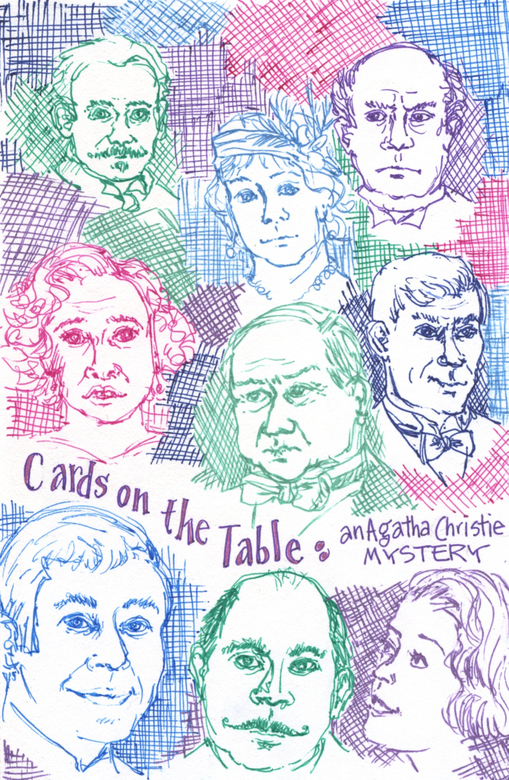 Gelly Roll gel pens were used for the other colors. Don't judge me when you read that I ate pineapple upside-down cake twice in one day! We live out in the country, and our mailbox is about a quarter mile from our house, out by the two-lane road. I often take a walk to the mailbox at lunchtime to stretch my legs and give Buckley, our golden retriever, a nice run. 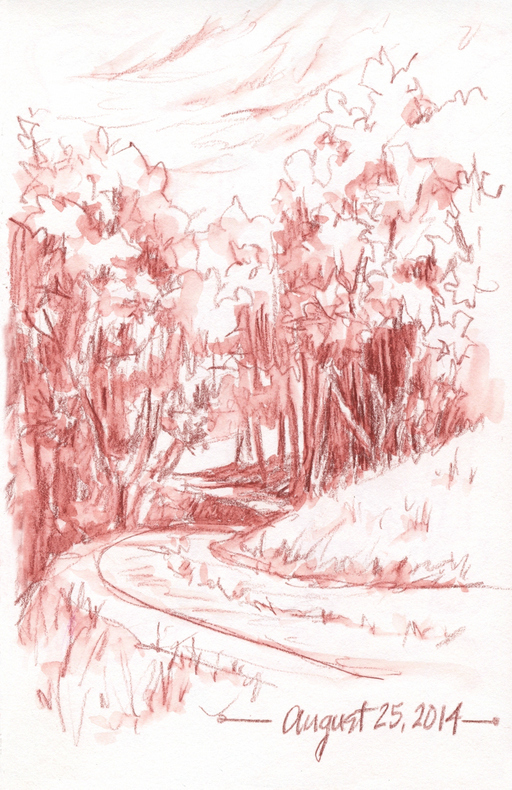 I've always enjoyed the view of the driveway curving through the shady woods, and finally one day I took my sketchbook along and stopped to draw it. Drawn with a Faber-Castell watercolor pencil (color 192). Water added later to paint the shadow areas. Looking at it now in the depths of winter brings back the feel of that sunny, warm, late August day. 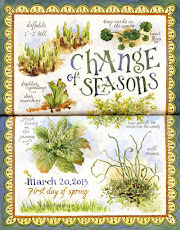 It may be going down to 1º tonight, but at least we have spring on the horizon and summer following soon after. Lots more sketches to come as soon as I get them scanned and uploaded! In just a few short months I'll be going back to Italy! I can't wait to see the Tuscan hills again and enjoy the endless delights of fresh, delicious Italian food. And the gelato...don't even get me started on that! 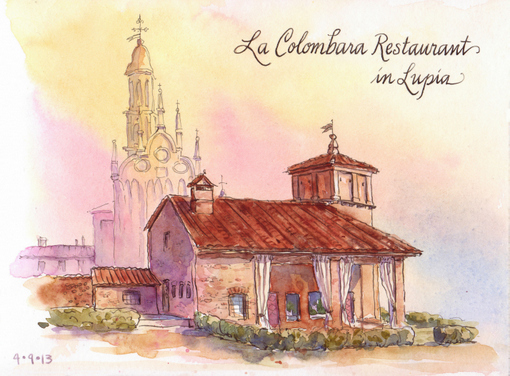 October 3-10, 2015, will find me teaching a week-long workshop in Sketchbook Journaling at Fattoria Bacio, in Certaldo, Italy. We'll be painting, touring, feasting, relaxing and having a great old time together. 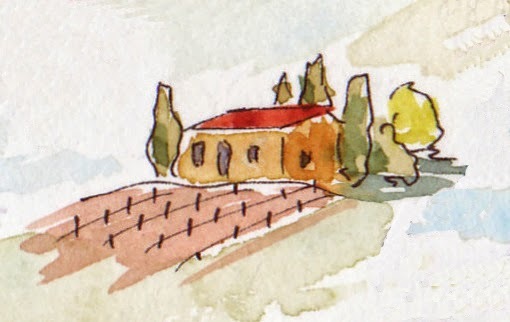 I thought you might enjoy a sneak preview of one of the painting tutorials I'll be sharing with my students in Tuscany. So, let's pretend for a moment that you're sitting on a sun-drenched hillside, straw hat on your head, sketchbook in your lap, pencil poised, ready to sketch a centuries-old villa with with a red tile roof. The rusty red color sings in a landscape filled with its complement, green. 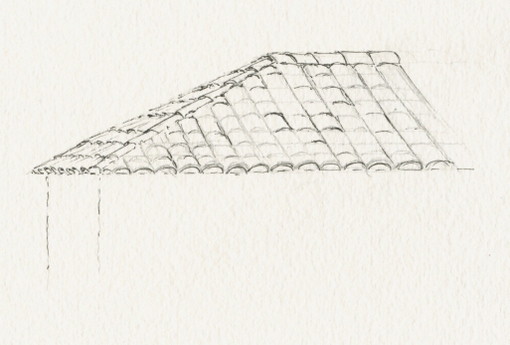 For a mid-range view, like the sketch below, a bit more detail can be added to suggest the dips between vertical rows of tiles. A few quick brush strokes serve to indicate individual tiles here and there. There's no need to paint them all. 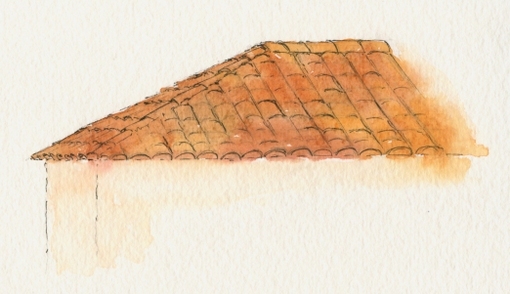 Study the roof and note any irregularities - a broken or crooked tile, an area that's moss-covered, etc. 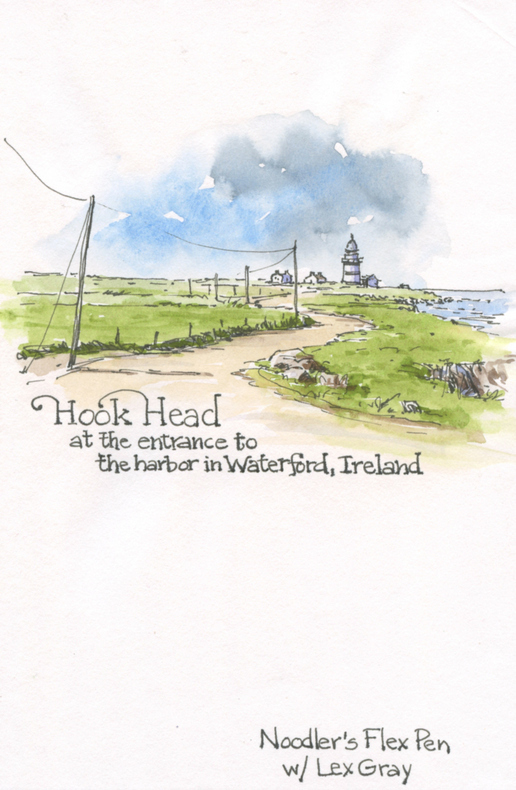 You'll want to include those unique details in your sketch. You're not just painting any roof, you're painting this particular roof. 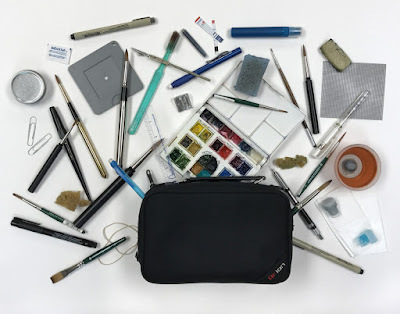 Do a preliminary sketch in pencil. This is your chance to figure out the angles and spacing of the roof tiles. Ink the sketch, if desired. 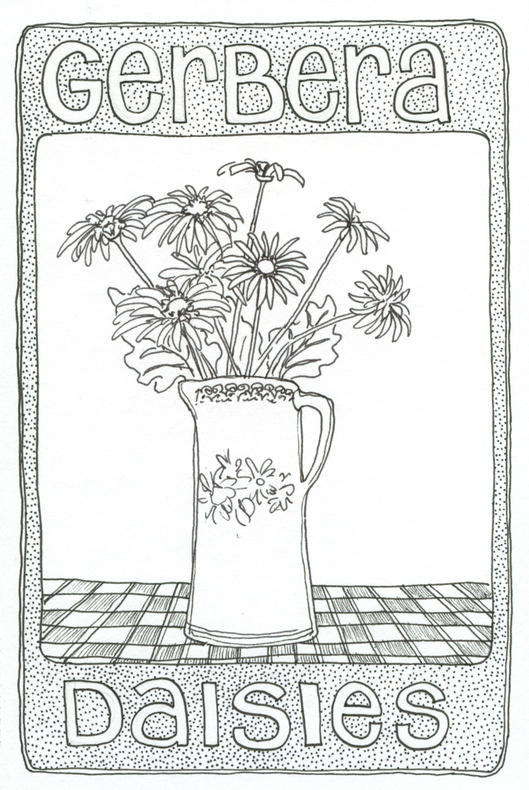 (I used a Pigma Micron 01 black pen for the sketch shown here.) 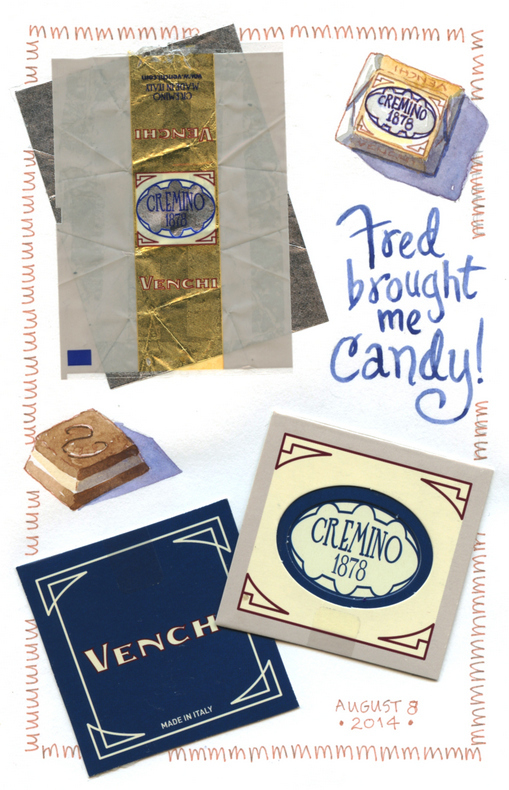 There's no need to trace over every pencil line or to draw every tile. Paint a variegated wash for your base color, which will be the lightest tones on the tiles. 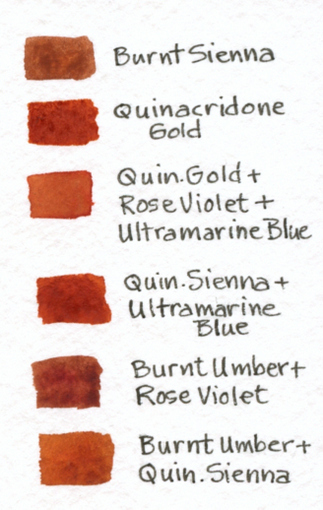 Use warm colors such as Winsor Orange, Burnt Sienna, Alizarin Crimson, Raw Sienna, Quinacridone Gold, or Burnt Umber. Touch the lower edge of the wash with a wet brush and allow some of the color to bleed onto the wall below. This will help to unify the painting. Add a pale warm tone to the wall, if desired. Add varying mid-tones to areas of the roof or to individual tiles. 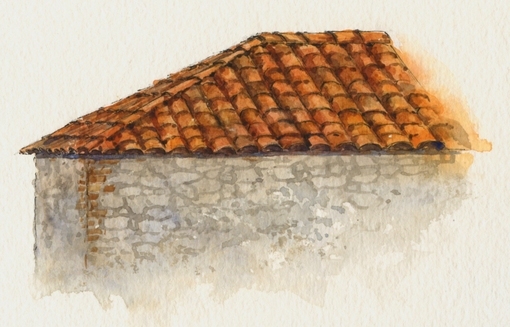 Paint a variegated base wash of greys, browns, and yellow ochre for the building's stone walls. Add shadows between vertical rows of tiles. Add shadows at the base of individual tiles. Vary the color and darkness of the shadows, so the tiles don't look too uniform. Paint the shadow under the bottom row of tiles. Begin painting the stone wall, indicating mortar joints. Use a natural sponge to dab on some color to indicate texture on the wall. Paint the darkest shadows on the tile roof. Add a touch of very dark shadow color under the bottom row of tiles. Use the same purple-grey to paint the shadow under the roof overhang. Run a clean, damp brush along the lower edge of the shadow to soften the line. Add any final spots of color to the painting. Lift highlights on the roof tiles with a damp brush, if needed. Here are some options for mixing convincing colors for terracotta roof tiles. 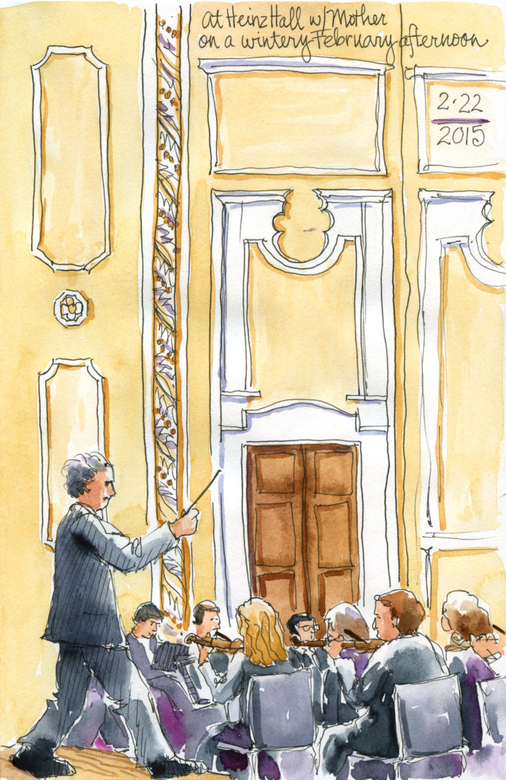 For more information about my all-inclusive workshop at Fattoria Bacio, October 3-10, 2015, click on the "Italy Workshop" tab above, or visit the Artravelitaly website. 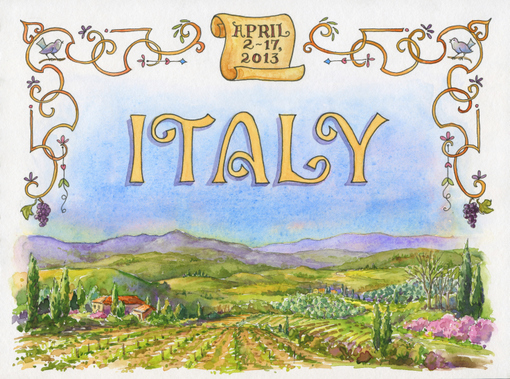 Let's paint Tuscany together! 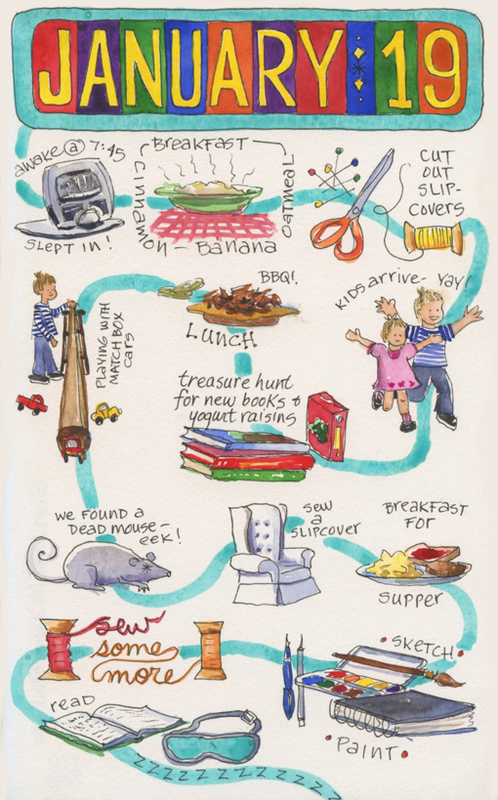 Winter Getaway: Sun, Fun, and Painting! Five days of sunshine, warm breezes, and gorgeous aquamarine water are enough to lift anyone's spirit. Stepping off of a plane in Florida in January is like emerging from a long, dark, damp, cold tunnel that you thought you'd never see the end of. There were palm trees and flowers and people wearing shorts! What a shock to my system! I always say I'd never want to move to Florida, but when I visit there in mid-winter, it's easy to understand why so many people do. It was absolutely lovely. Travel delays, crowded airports, and broken airplanes didn't do a thing to dampen my enthusiasm for this trip. When I changed planes in Charlotte, NC, we ended up having a maintenance issue which required us to sit on the plane while the crew did some trouble shooting. I took the opportunity to do a sketch for day 23 of the January Challenge. Hunched over my sketchbook in my window seat, trying not to be too obvious to my bored neighbor in the middle seat, I sketched a nearby fueling contraption. I drew quickly, directly in pen, since I wasn't sure how long I'd have before we were on our way. Guess I'm an optimist at heart - I thought we'd be airborne in a few minutes. We ended up having to deplane and switch airplanes. Luckily, my husband, Fred, an airline pilot, just happened to be in the terminal, and he brought me lunch while we waited to board the flight. A secret rendezvous in the Charlotte Airport – oolala! Beware of sketching in airports - I was so engrossed in inking the drawings on this page that I almost missed the boarding calls for my flight! 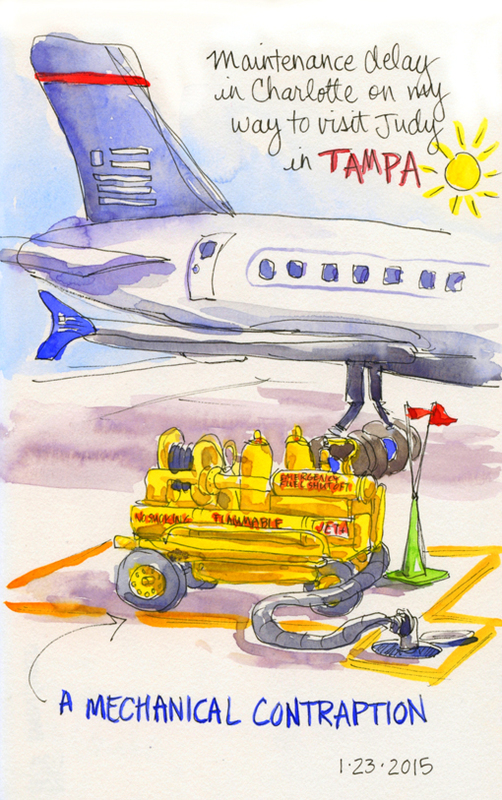 I finally made it to Tampa, ready for some fun in the sun. 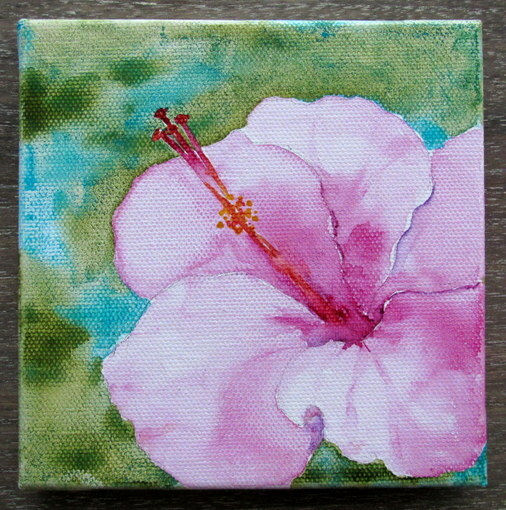 My friend, Judy, and I headed for the beach at Anna Maria Island one day and spent hours soaking up the sunshine. It was such a gorgeous day! Clear blue sky, crashing waves, and powdery white sand. I was in heaven! 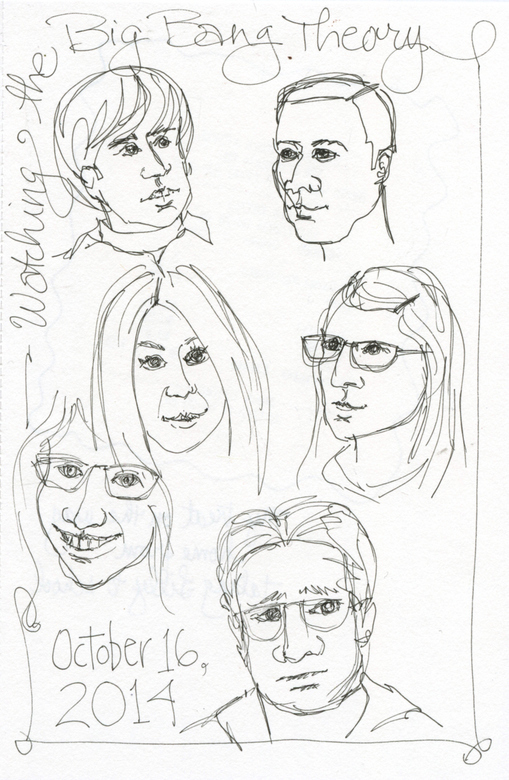 It was fun talking with people who walked by as we sat and sketched. Everyone was so interested and complimentary. 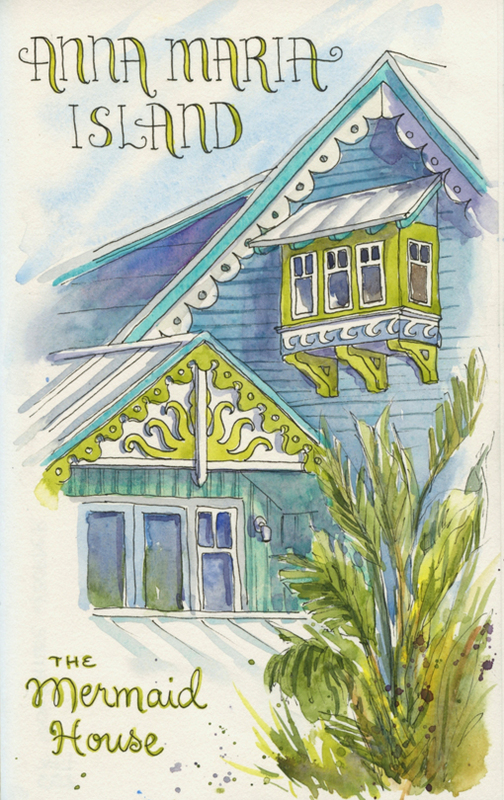 One couple told us a little bit about the house we were sketching – it's called the Mermaid House, and it's going to be featured in an upcoming issue of Coastal Living Magazine. I can't wait to see the inside of it! 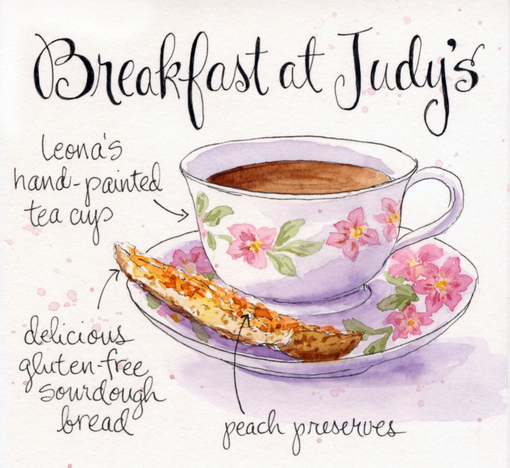 The next morning, Judy set out a pretty hand-painted cup and saucer for my morning coffee. Fresh coffee, delicious gluten-free sourdough bread (which I have never found anywhere but at the Sarasota Farmer's Market we visited) and yummy peach jam made a delectable breakfast and a really cute sketch. Later in the trip I got to meet Leona, the sweet lady who painted the china. At 93, she still travels, paints beautiful china pieces and teaches others how to paint. How cool is that? The Saturday farmer's market that we visited in Sarasota was wonderful! 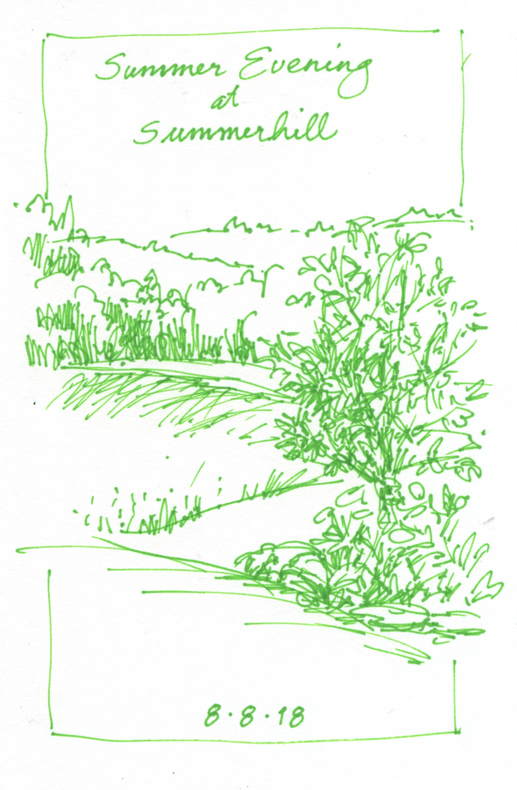 I kept wishing I had brought my sketchbook along – I wanted to just plop myself down in front of one of the produce stalls and sketch the amazing array of vegetables they had on display. I haven't seen produce like that since I was in Italy. I have to admit, I'm extremely jealous of the people who get to shop there every week! Judy and I bought some fresh beets and cooked them up for dinner that night to have alongside some wonderful shrimp fresh from the gulf. We boiled the beets, peeled and sliced them, then drizzled them with balsamic vinegar, and dropped on some chunks of feta cheese. Mmmmm, so yummy! I had never had fresh cooked beets before, and they were delicious. The beautiful color of the beet water caught my eye. I said to Judy, “We should save this and do a sketch with it!” “I was thinking the same thing!” she said. Brilliant minds think alike, right? So I pulled out my Monologue sketchbook, and painted a wash over the whole page, just to see what the color looked like. Hmmm, it was much more muted than it appeared in the pot. I set it aside to let it dry. We left the beet water sitting out on the counter for a few days, and when I got back to it, it had evaporated a little, so the color was a bit more concentrated. 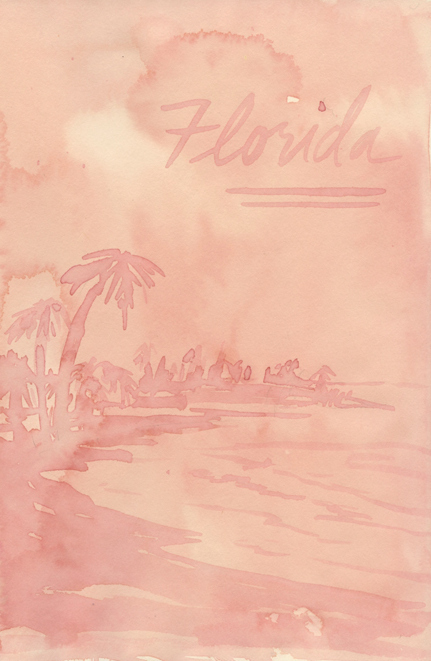 I used it to paint a quick Florida beach scene over the original wash just for fun. 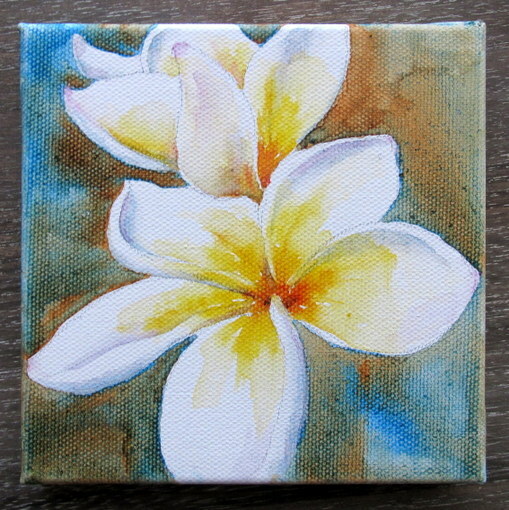 We stopped in at Keeton's Art Supply in Bradenton one day and had the bright idea to buy some 5” x 5” canvases to try painting tropical flowers in watercolors on them. It ended up being a really fun project. 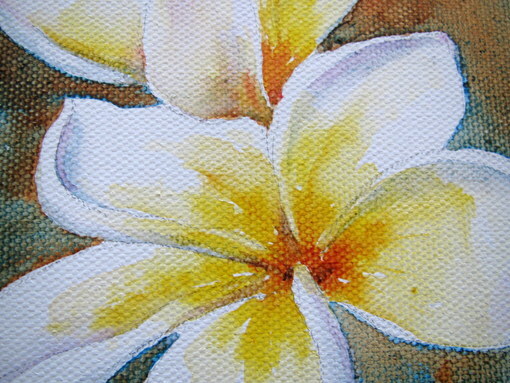 Watercolor tends to slide around a lot on the canvas, which gives the paintings a nice watery feel. 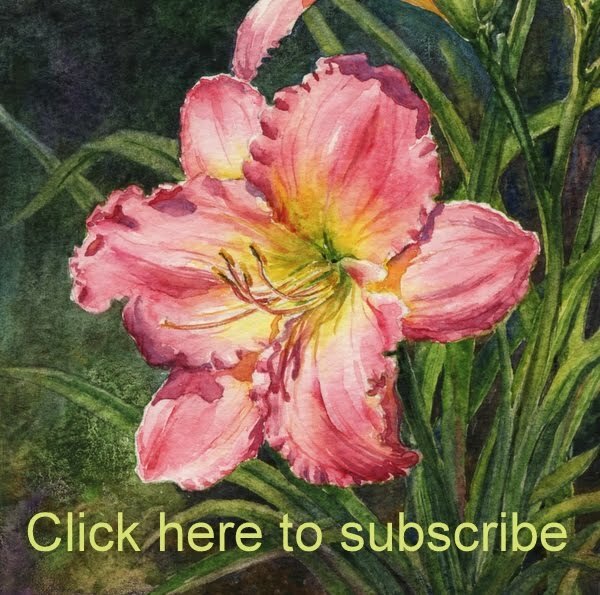 A light touch is required to layer the watercolor, as the under layers tend to be lifted by subsequent layers of wet paint. I ended up painting fairly directly, without much layering. We even painted the sides, so they can be hung without a frame. 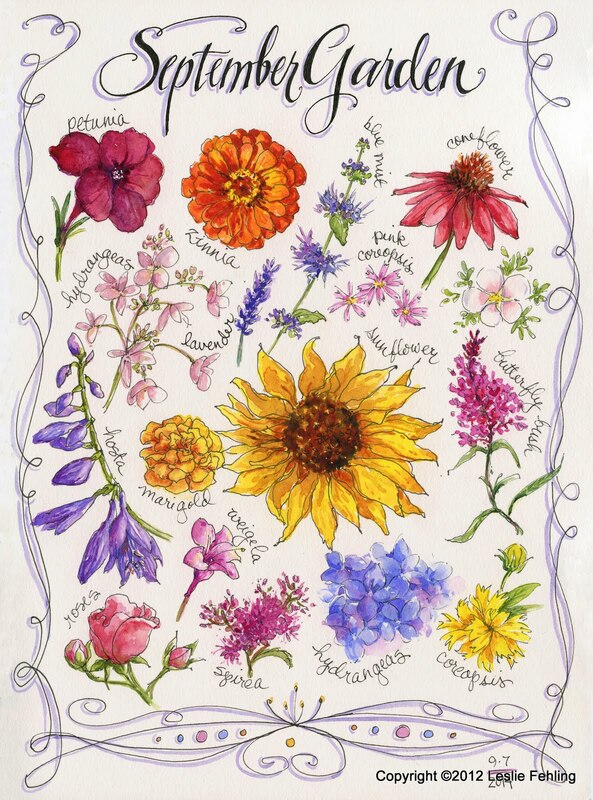 The process: I drew the flowers in pencil, then painted the backgrounds and let them dry. 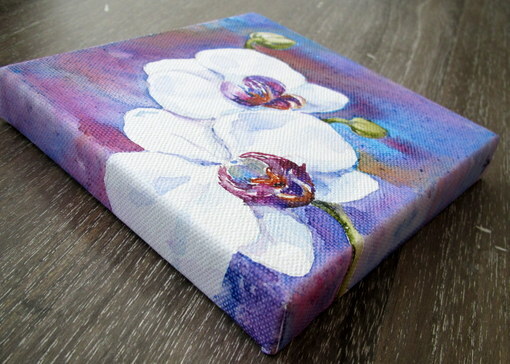 The final step was painting the orchids, frangipani, and hibiscus. 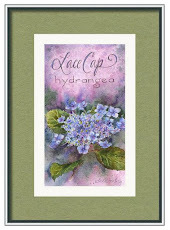 There are watercolor grounds you can use to make painting on canvas easier, and canvases made specifically for watercolor, but this fun experiment was simple and straightforward and gave us the results we wanted. These little cuties will hang in Judy's new house and remind her of her friend from the great white north whenever she sees them. This winter break from the cold and gloom was just what I needed. Getting away for a few days really jump-starts my creativity. I find that when I give the busy, preoccupied part of my brain a rest, my imagination takes over and ideas begin to flow. My husband jokes that it's dangerous to take a car trip with me, because all those long hours of boredom usually result in some incredibly awesome new project that involves work for him. It's great to be home, though, and I'm actually looking forward to a couple of more snowstorms before winter's over. I love being snowed in!